Look, it’s a typeset book, with crop marks and all. Just fyi, for Alliance, this is also the version we used to create the copy to read online. We’ll probably do the same for Confluence. Just need to get an okay to put it up. 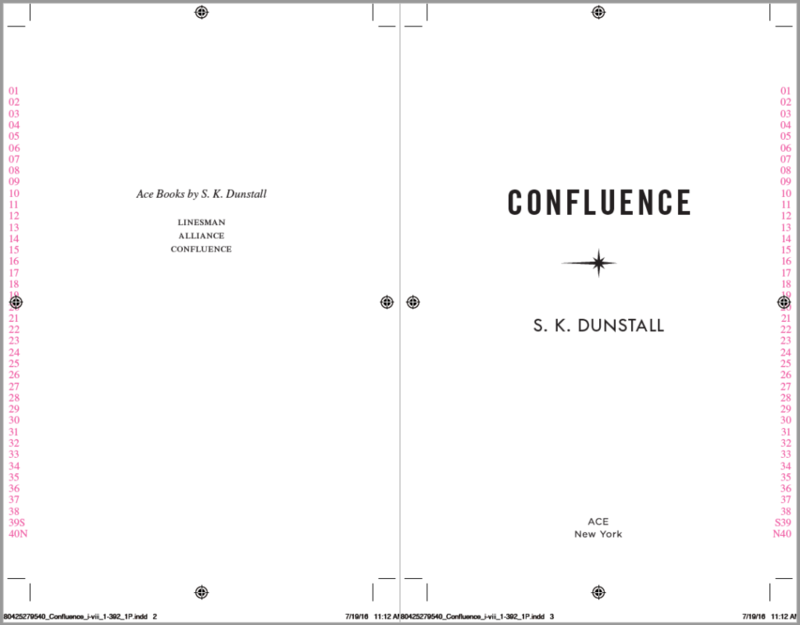 The digital proofs for Confluence arrived the other day. This is a PDF of the typeset book. It looks like a book. It’s the last stage before the books are actually printed. From this we get the green galleys—uncorrected proofs—that we can start sending out to people to read. You can’t change anything at this stage, only pick up errors. Meantime, we have moved onto the next book, and there has been time between our last copy edit and this typeset document arriving, so this is the first read in a long time that we actually have some objectivity reading the book. Beforehand, we have been so immersed in the story we have no objectivity at all. There are a few things we’d change. Clunky paragraphs here and there, repeated information. But overall, Sherylyn’s enjoying the read. Do you find then that both of you get caught up in the story and “can’t see the wood for the trees” as I would’ve thought having the two of you one would act as counterbalance to the other. But I guess even then you need the time and space so as not to fill in the blanks as it were since the story is so close to you. Will either of you read your own books after they’ve been published? Sometimes we counterbalance each other when we edit, but often we’ve both been looking at it for so long that neither of us have perspective. That’s where agent and editor feedback becomes so valuable.And good beta readers too. As for reading our own books. So far we haven’t deliberately sat down to read one. We do find ourselves reading parts when we’re researching later books. We open a story to find out one fact, and realise it’s an hour later and we’ve just kept reading. How exciting! It is wonderful to hear that you are working on #4! I adore this series and I have re-listened to the audio versions multiple times and completely buy in on the world and characters. The new book, the one we’re working on, isn’t actually part of the series. It’s totally separate. That doesn’t mean to say we don’t have other Linesman books (Acquard, anyone?). It just means that this is the one that appears more commercially viable at present. (It all comes down to what our agent thinks she can sell.) We have lots more linesman stories to tell. More about the lines, more about the characters. And, of course, the [spoiler, can’t say, but let’s just call it the elephant in the room; that’s a trilogy in its own right].